Recently my running buddy Brian mentioned ugly race t-shirts and he sent me a photo as an example. I've compiled well over a dozen race shirts in the last couple of years and many of them would clearly fit into the ugly category. 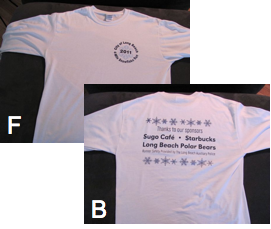 This weekend I received my latest shirt for the Long Beach Snowflake Run and was pleased to see it was attractive enough to wear in public. My wife loves snowflakes and cozy long sleeved shirts so I expect that it will soon become hers. 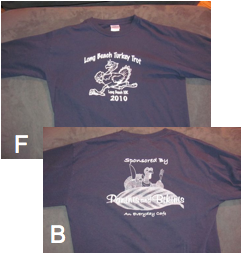 The other Long Beach race shirt I have is from last November's Turkey Trot. It's not a great looking shirt but it's fun and also long sleeved. I PR'd in that race so I enjoy wearing it. 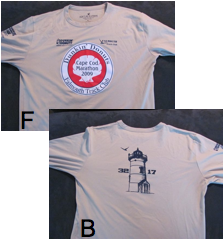 I participated on a Cape Cod marathon relay team in October of 2009 and the race shirts were very close-fitting technical long sleeved shirts. The front is about as ugly a design as I've seen (plus Duncan Donuts and running are a strange combination) but the back has a cool lighthouse. It's actually a good between-seasons running shirt and I especially like wearing it on trails. 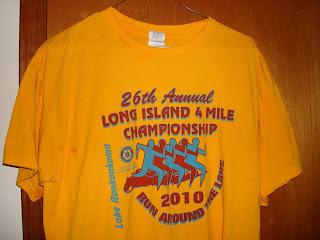 The first race I ran in 2010 was in March, less than two months after my stay in the hospital for pneumonia. The race in Stillwell Woods was challenging and my successful run told me that I was back and fully recovered. We got technical racing shirts and I am proud to wear mine outside my home. As a wicking shirt it's just okay, but it will certainly do in a pinch. 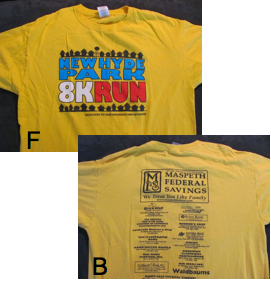 The 2010 New Hyde Park 8K shirt was a decent design, but the year before it was an explosion of red, white, blue and yellow. The back was no cleaner though it wasn't as garish as the front. Kudos to the organizers for making a change for the better last year. In my opinion the Ugly Duckling Award goes to the race shirt that actually has a duck on it. The Dirty Sock Run is a great event and the organizers always give out both a t-shirt and a pair of socks printed with the words "Dirty Sock Run." I love the socks (although my son immediately commandeers them) but the shirts are not attractive. The shirt color from the last Dirty Sock 10K is a strange blend of muddy brown and magenta. 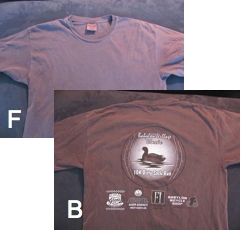 The front is blank and the back has a graphic of the event's logo -- a duck on the water. The prior year's shirt was not much better - pea soup green instead of muddy brown with the logo on the front. Actually, I love all my race tees no matter how they look. Each one reminds me of a special time and the accomplishment of participation. 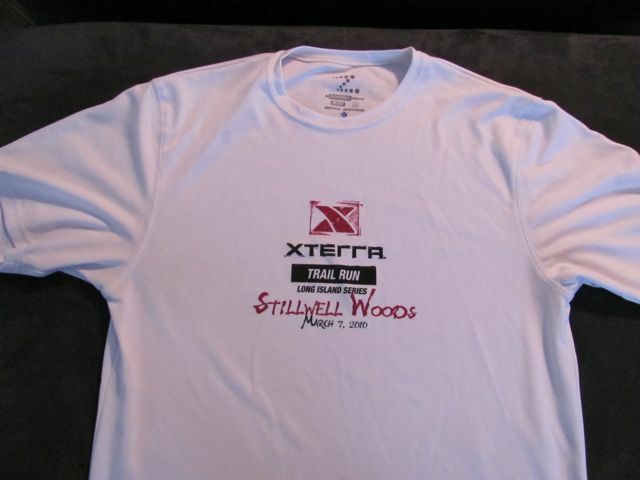 Still, if a race organizer has the choice of making a shirt more attractive, it would be time well spent to do that!